Oselbridge is a welcome waystation for weary travelers on the Genin Trail, the road between Tashal and Thay in eastern Hârn. The bridge is the only crossing of the Osel River and most travelers spend a day or two at this oasis of civilization. Because of its strategic location, there has been an on-going dispute over control of Oselbridge for centuries. 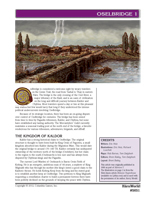 The bridge has been seized from time to time by Pagaelin tribesmen and the kingdoms of Kaldor and Chybisa; none have established any lasting authority. A seasonal trading post maintained at the bridge by the Mercantylers' Guild is a favorite rendezvous for tribesmen, adventurers, brigands, and riffraff. The Oselbridge article describes the bridge's history and the various factions vying for control of it. It includes full-color GM and player maps of the area around the bridge and trading post. This is a Hârn Classic article and was originally published in 1989 as part of Hârnlore 7.